Also referred to as sliding folding doors, our range of U-PVC and timber bi-folding doors are guaranteed to grab consumer attention and help you win new business. 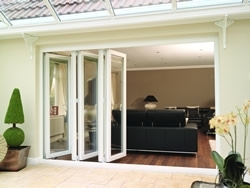 Dempsey Dyer uPVC bi-folding doors are fabricated using the Deceuninck 3000 series contemporary profile. They feature our standard PVCu French door locking system that is integrated with aluminium tracks to the top and bottom for superior security. All of our bi-folds are bottom hung and we recommend that they open inwards to limit the weather exposure of the ironmongery. Designed specifically as an external door, the bi-fold sashes are 58mm thick to allow improved locking and draining systems to be incorporated. Available with 24mm double glazed units, our bi-folding door system benefits from flush fitting sashes, providing clean lines when open and closed. Our standard range of bifolds allows an overall width of 7 meters and a maximum of 7 door panels. Max overall height: 2.700 meters. Door leafs manufactured from our 58mm residential section with 110mm wide stiles and 220mm bottom rails.